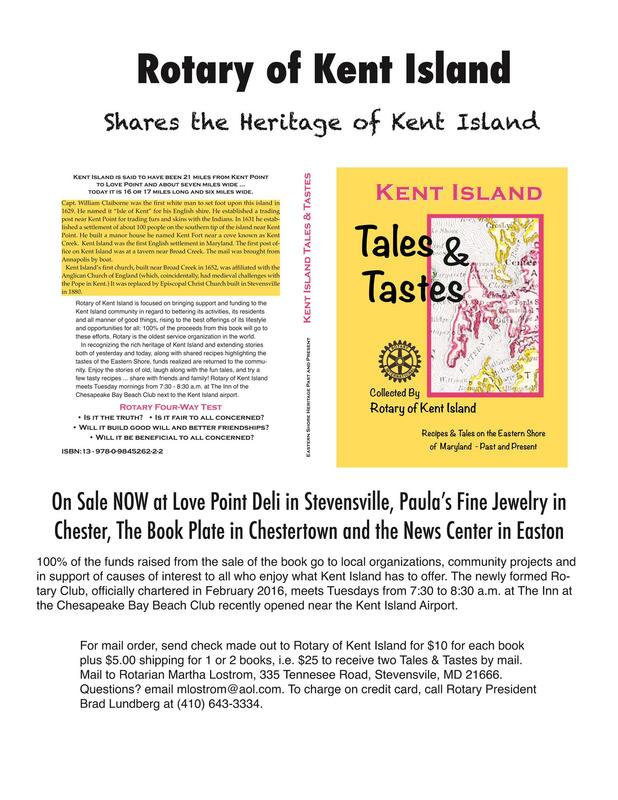 Rotary Club of Kent Island recently published Tales & Tastes, a compilation of stories from yesterday and today about Kent Island along with shared recipes highlighting the tastes of the Eastern Shore. Proceeds from the sale of this book will help fund projects for the betterment of the Kent Island community. On Saturday, April 9th, join us for a fun evening of table games at the Kent Island Yacht Club with chances to win prizes donated by local business. Use your winnings at the end of the night to bid on fantastic Live Auction items. Purchase advance tickets for $25/each and receive $50 in chips. Contact a Rotarian to purchase tickets or call 410-490-8837. Sponsorships are available. More info. Thank you to the Inn at the Chesapeake Bay Beach Club for hosting our Club's weekly meetings. The Inn features 54 luxurious boutique guest rooms and suites that are beautifully appointed with high end furnishings, amenities and views of the Chesapeake Bay. The food and beverage offerings will include Knoxie’s Table, a farm-and-bay-to-table style restaurant, and The Market, a gourmet marketplace and grab & go café, featuring dishes that will draw inspiration from the Inn’s Chef Garden along with the extraordinary farmers and watermen of Maryland’s Eastern Shore.Whether it be a wedding reception for 120, a rehearsal dinner for 50, or a board retreat for 10, the Inn’s extraordinary event spaces will create a one of a kind, memorable experience. 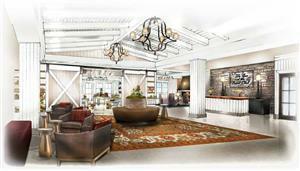 The Inn is a place where families join to celebrate, friends come together, and guests check-in to slow down and unwind. For reservations at The Inn call 410.604.5900 or visit their website. FEED A FAMILY serves the less fortunate in Stevensville, Chester, Grasonville, Queenstown, and parts of Centreville. Anyone who needs food for Thanksgiving can call for help. 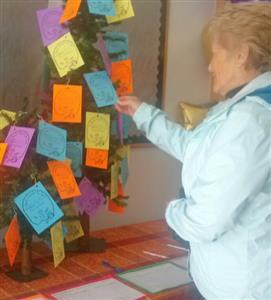 This is a neighbor program, sharing God's blessings with others. Their main focus is getting the Turkey Tags displayed, chosen, filled and delivered to their distribution center, and then delivered to families the Saturday before Thanksgiving. They use food drive donations to supplement boxes made by folks filling the Turkey Tags, giving a little extra to large families. All extra food gets distributed to local food banks. Donated grocery gift cards are distributed to church groups that have a Christmas Basket Food Program to allow them to serve more families. FEED A FAMILY is totally independent: does not work with governmental agencies and receive no outside grants. 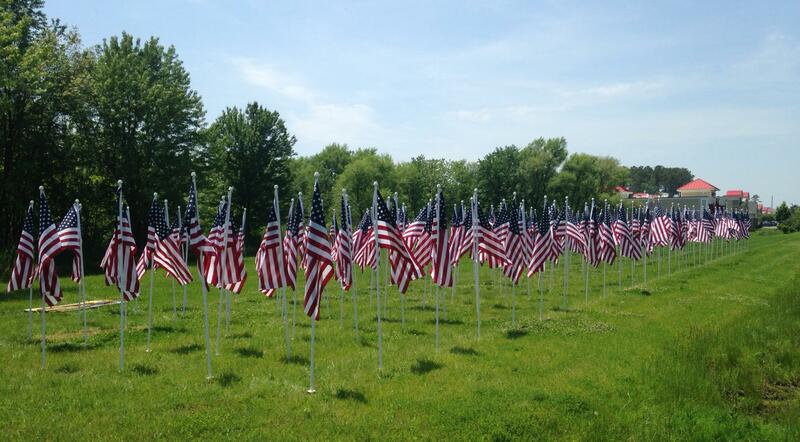 They encourage all the local churches to work together, under one database, to attempt to serve as many as need help. FEED A FAMILY is eternally grateful to the community businesses and groups that support them with physical needs each year: the building, tables, boxes, freezer truck, local produce, fresh bread. They offer a YOUTH NIGHT service opportunity; organizing and packing the Food Drive donations that go to local food banks. Needs continue to grow: Would you participate this year?